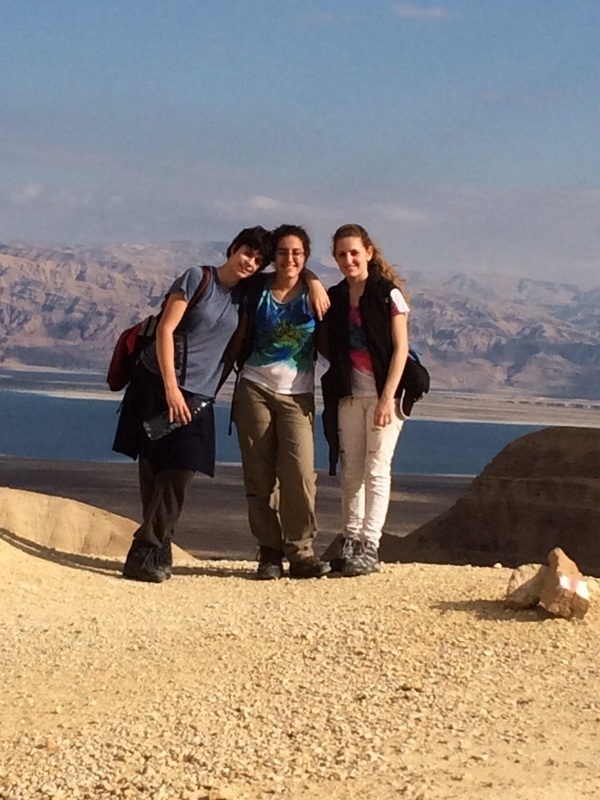 You can hike in Israel year round, but if you want to walk the desert, go in the winter. 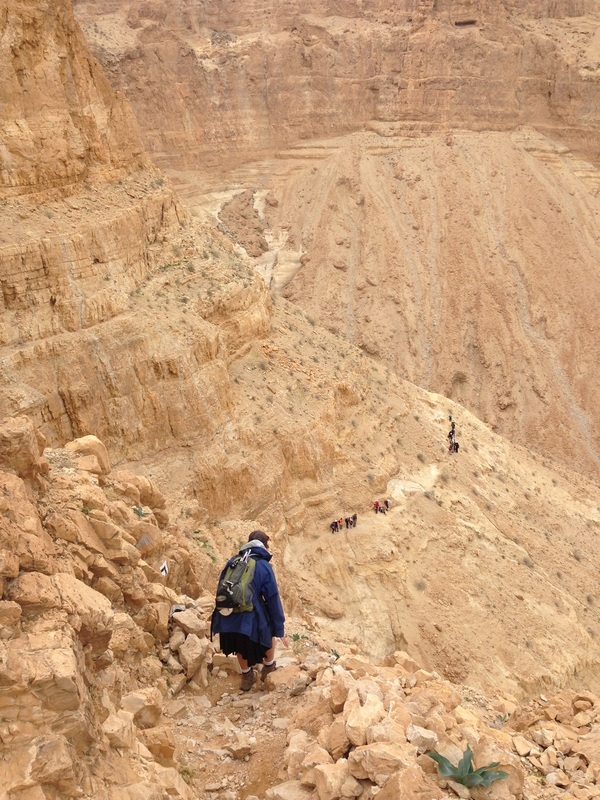 For spectacular natural scenery, exhilarating mountain walks and superb silence, choose a trail in the Judean Desert. 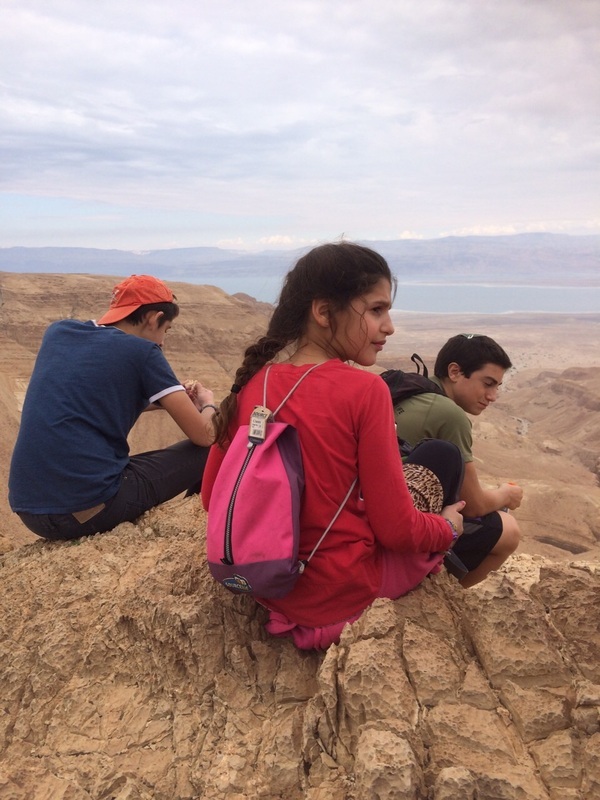 It was Chanukah, our children were on vacation, and adventure was calling. 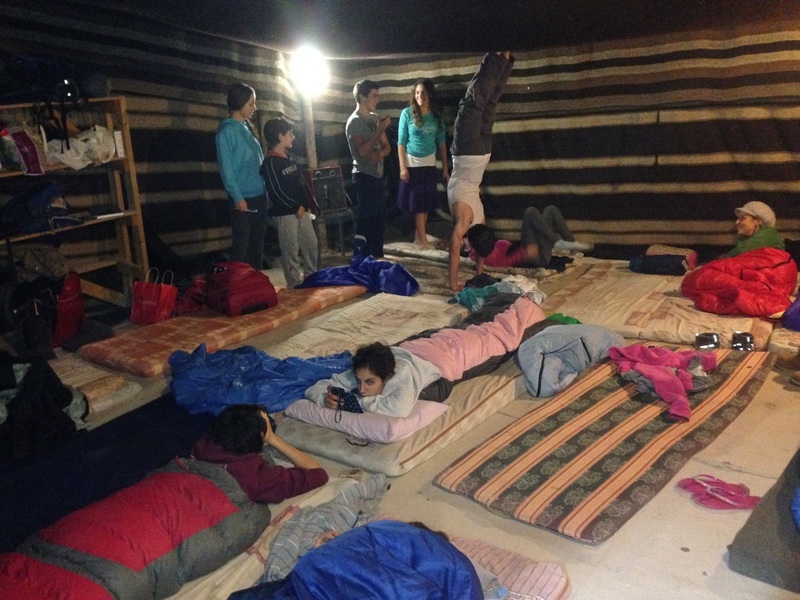 We gathered our camping gear and joined a group of friends at Metzoke Dragot Village. 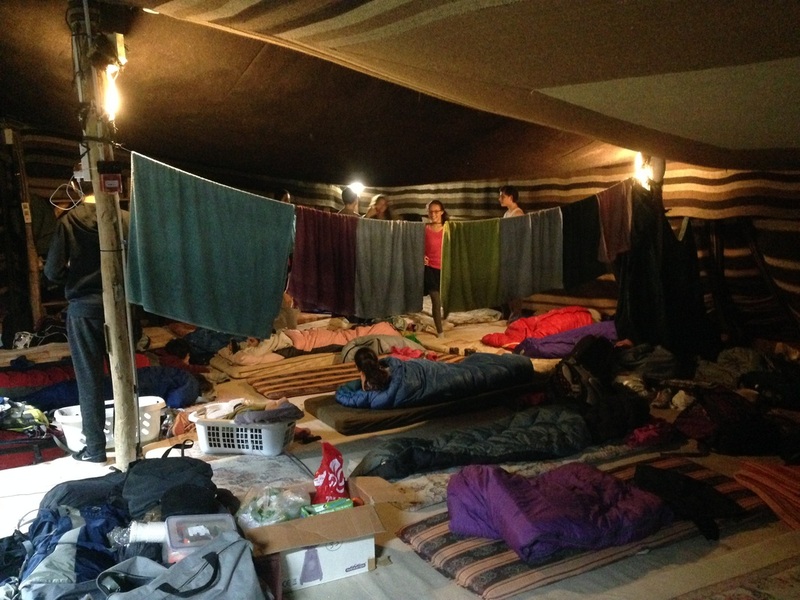 Here you can camp Bedouin-style in a large tent. Mattresses are supplied. There is a picnic bench for meals, clean washrooms and showers, plus a place to charge your phone (or plug in the crock pot). 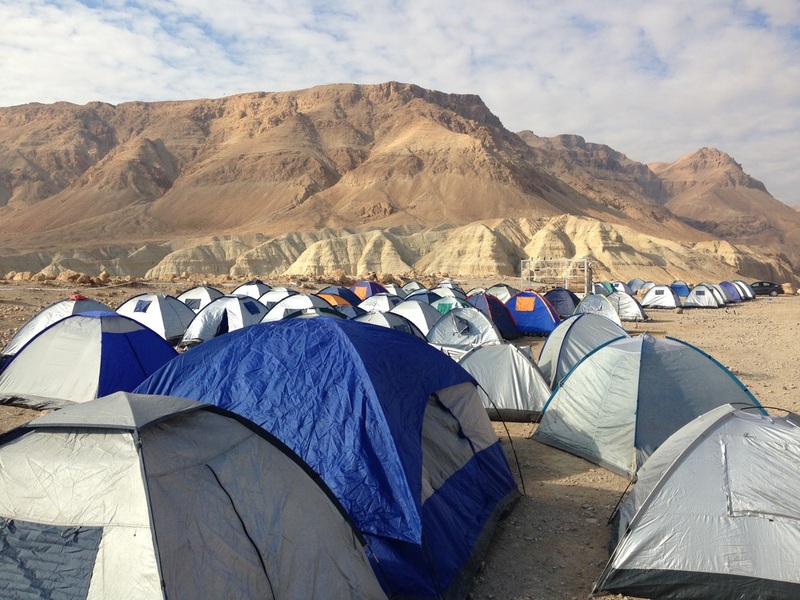 Open the tent flap in the morning and you’re facing craggy desert mountains with the Dead Sea beyond. 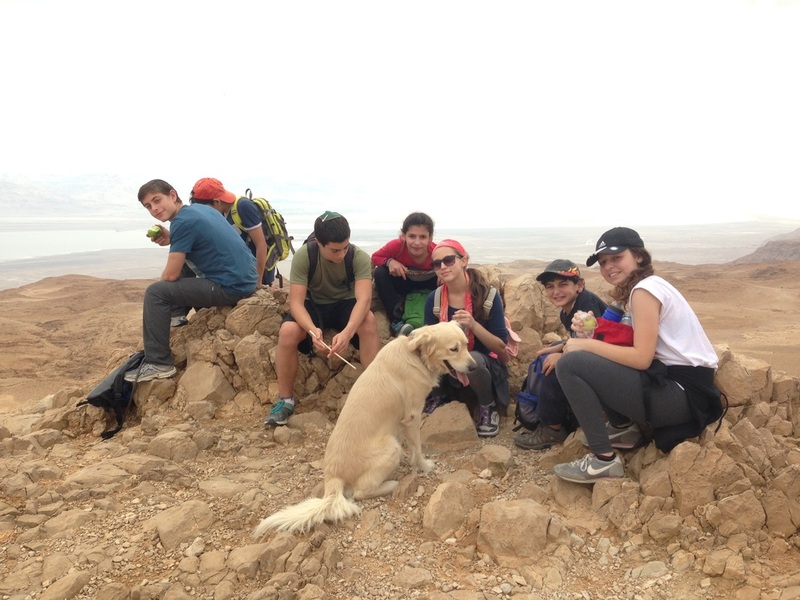 Our group was composed of 6 adults a lively bunch of 16 kids aged 7 to 17, and one friendly dog. At night, we lit our chanukiahs, sang and watched the oil lights flicker in the cool desert air. The next morning, we peeked out of our tent with bleary eyes to a soft dawn outlining the mountains. We davened, then got to work preparing food and supplies for the hike. Large groups tend to move slowly and some three hours later, we were just about ready. 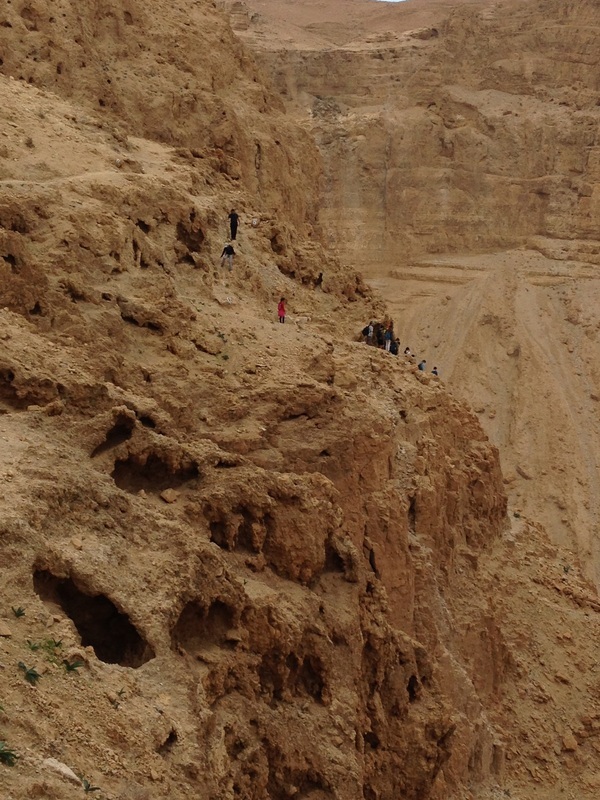 We piled into cars and drove south down Highway 90 towards Masada. We dropped off a car at the end point in the Nahal Mishmar parking area, then drove to our starting point, Nahal Ze’elim. 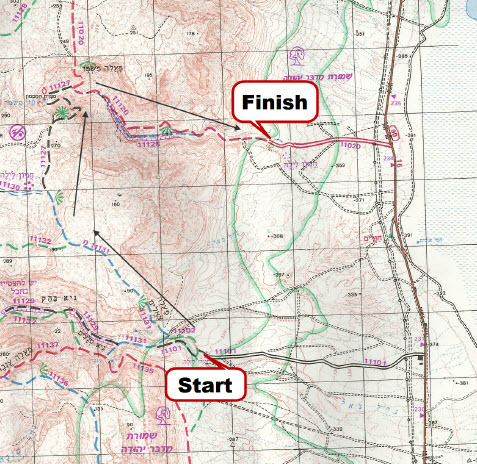 The starting point is at Highway Market 234. Turn right then drive slowly down the bumpy, dirt road some two kilometers. There is a parking area and a camp site here. A few words of warning. Do not leave valuables in the car. Carry at least 3 litres of water per person (winter time) and wear a hat as the entire hike is exposed to the sun. Be sure to inquire about flash flood warnings before you set out. 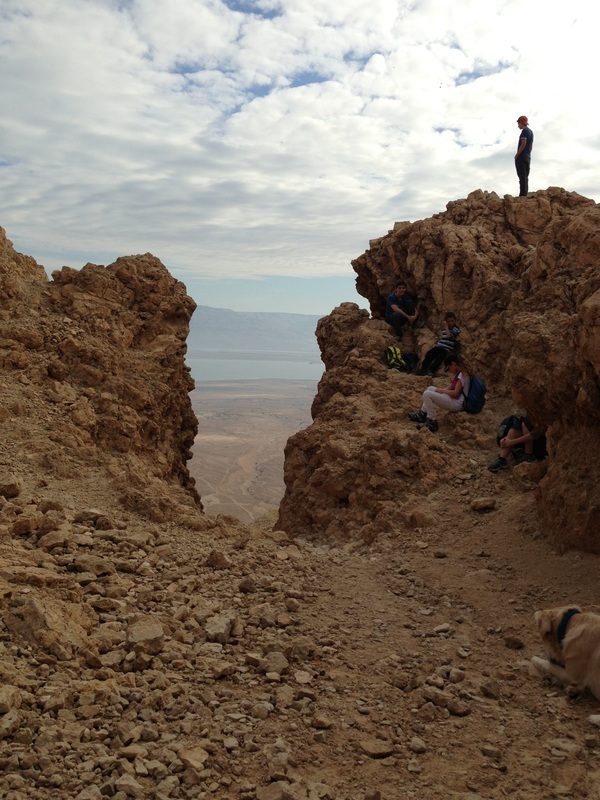 Our backs to the Dead Sea, we set out following the red blazes towards the Mountains of Judea. The gathering cloud clusters were grey tipped, an ominous sign of rain in a usually clear, turquoise sky. We knew rain was forecast for the late afternoon and since we would be walking though a canyon in the latter part of the hike, we were vulnerable to flash floods. With this in mind, we tried to quicken our pace. We ascended up and up and up. Then up and up again. The climb was strenuous but envigorating. The cars in the parking lot became small specks as we climbed, ascending 375 meters in the first hour (2 ½ kms) of the hike. 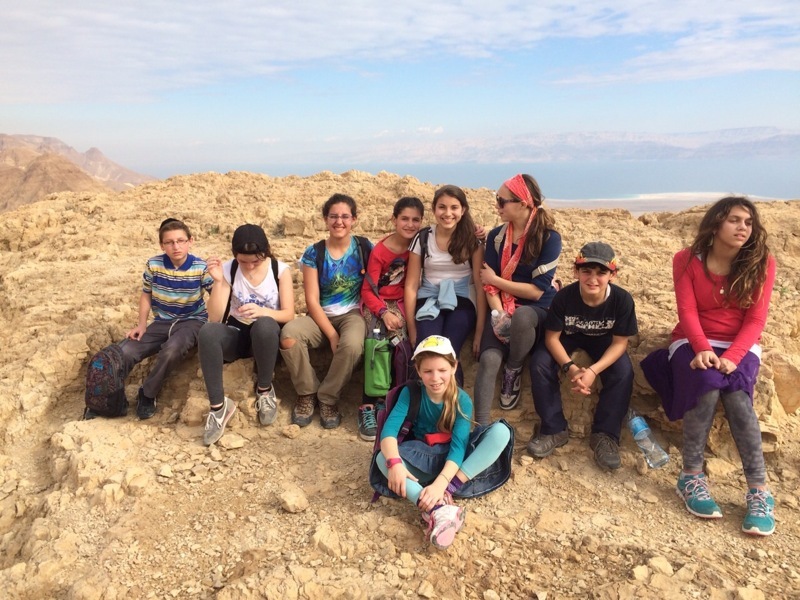 We took a break at the top, admiring views of the Dead Sea, then walked steadily up and across a plateau with exquisite moonscape views. Starlings chattered from rock ledges. Eagles hovered mid air, their wingspan wide, a silent glide. When we stopped for a short lunch break, we could see our end point in the far distance. It looked about five minutes as the eagle flies but was, in reality, another strenuous three hours by foot. The hike descended quite sharply and we had to use rocks for handholds and for balance. As we descended into Nahal Mishmar, we were not far from the cave of the famous Nahal Mishmar Treasure. In 1961, Israeli archaeologist Pessah Bar-Adon found over 400 Chalcolithic objects in a cave accessible only by ropes and ladders. Dating back some 6,00 years, these bronze, ivory and copper scepters, mace heads and weapons were used in a shrine at Ein Gedi. They are now in a permanent exhibit of the Archaeology Wing at the Israel Museum. 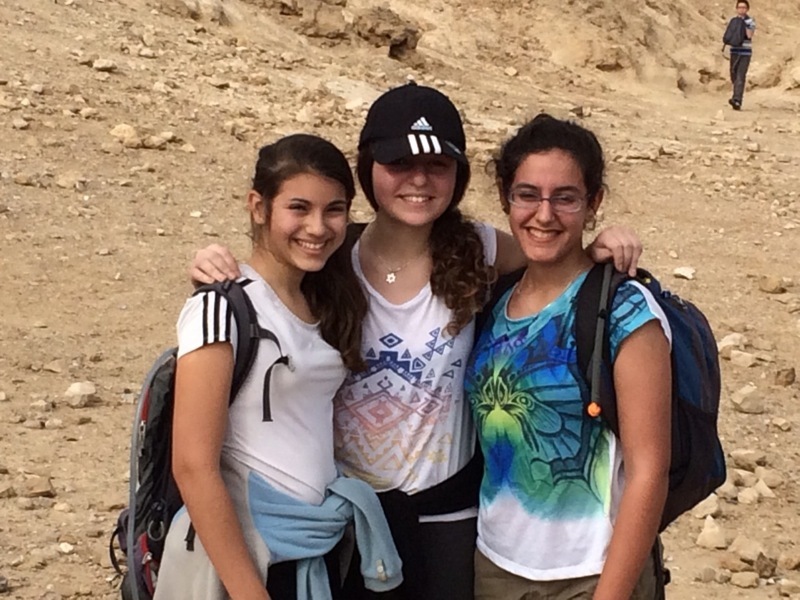 We hiked into the dry streambed of Nahal Mishmar. 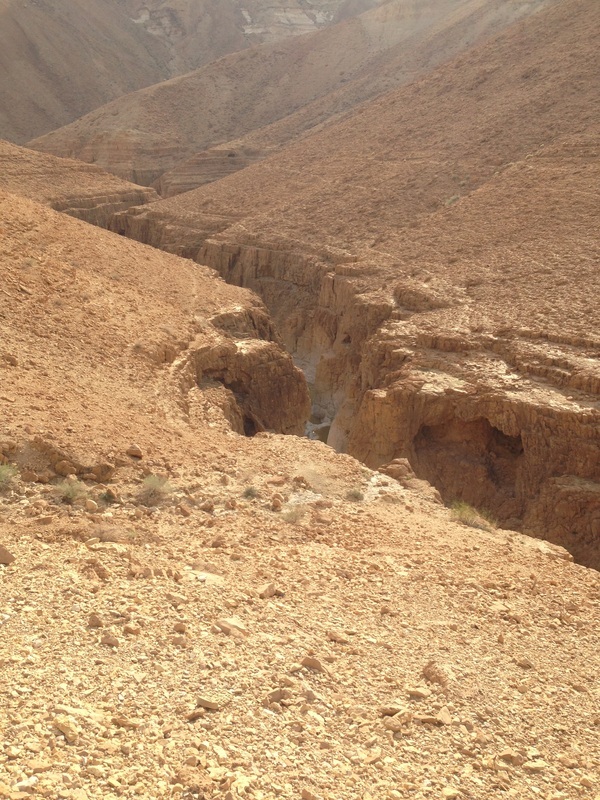 This river begins in the Hebron Hills about 270 meters above sea level, then falls more than 300 meters into the Jordan Rift Valley before reaching the Dead Sea. We followed the winding riverbed then walked alongside a white chalkstone gorge with deep pools of water. These pools fill up with cold rainwater in the winter; in the summer they can be climbed using ropes and footholds. 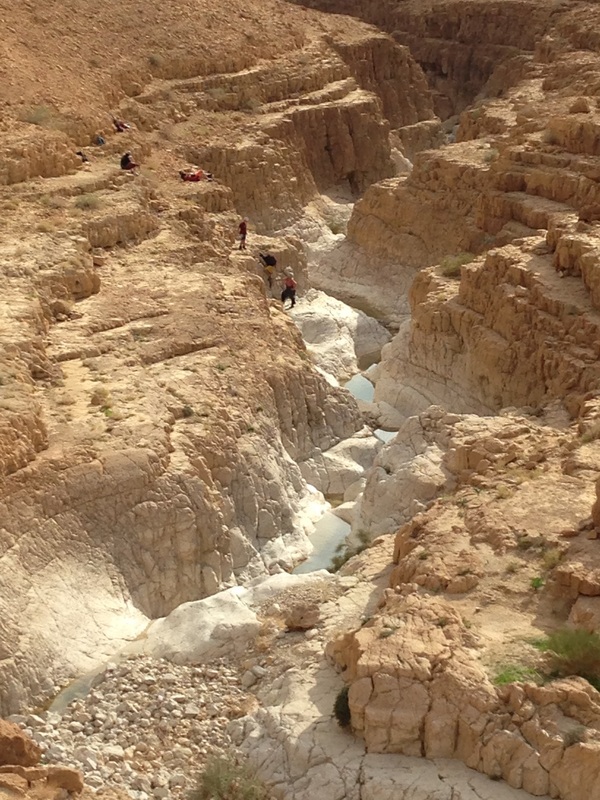 The hike continued along this rocky riverbed to the end, mountains flanking on both sides with views of the Dead Sea ahead. It was an exhausting and satisfying day filled with fun and adventure. And no rain from those ominous clouds...our own little Chanukah miracle!